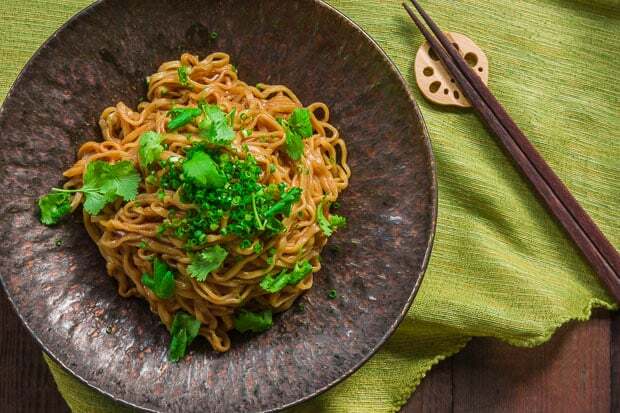 These triple garlic noodles feature a trinity of fried garlic, black garlic and raw garlic in an impossibly flavorful sauce that can be tossed with your favorite noodles to make for a delicious entree or savory side. Garlic is truly a wonder ingredient. Not only does it have the power to transfer its potent flavor into other foods, bringing mundane ingredients to life, it’s also capable of transforming into completely new flavors based on how it’s prepared. When raw, garlic is crisp, pungent and spicy. Fry it at high temperatures and it becomes crunchy, smoky and nutty. Finally, cooking it at low temperatures for weeks transforms garlic into sweet, mellow nuggets of umami. To capture all of garlic’s many facets, I set out to create a garlic sauce with this trinity of garlic. We all know that frying garlic brings out new flavors in it and makes your kitchen smell amazing, so I started the sauce off with garlic that’s been fried until crunchy. But while the quick fry achieves caramelization and the Maillard reaction does take place, it hasn’t reached it’s full potential. That’s where the black garlic comes in. 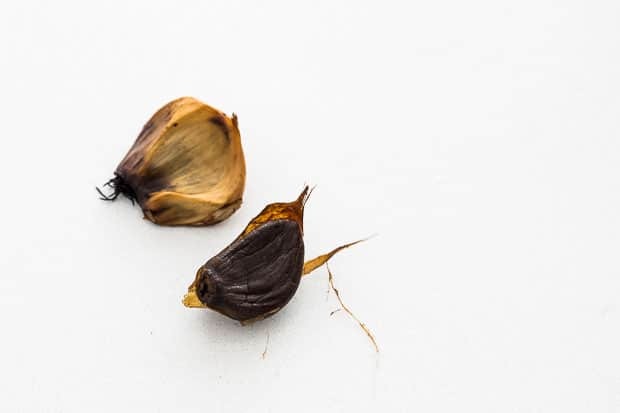 In case you’ve never heard of it, black garlic is normal garlic which has undergone the maillard reaction over the span of a month rendering the cloves coffee black and completely transforming its taste to something closer to a mix of balsamic vinegar, molasses and oyster sauce. This is where the sauce gets its sweetness, subtle tang and boatloads of umami. Finally, because the two forms of cooked garlic lose some of its fierce intensity, I add a bit of raw garlic into the sauce to punch up that pungent umph, giving it a well rounded garlic flavor that covers all the bases. 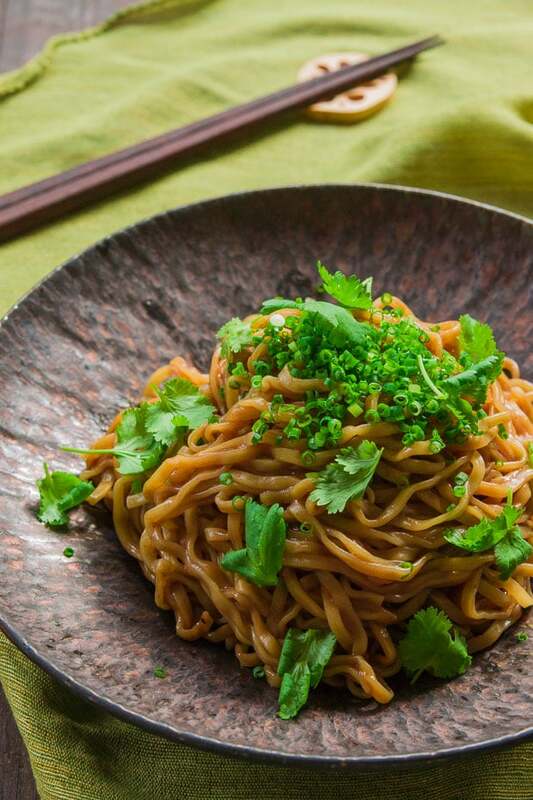 The finished sauce is ridiculously good, with an unapologetic garlic flavor and intense umami that will have people wondering if you snuck some MSG into the sauce. I mentioned before that black garlic tastes a bit like oyster sauce, but the finished sauce tastes even more-so, which makes it perfect for tossing with steamed greens and for adding to stir-fries and marinades. As for the noodles, I used some curly ramen-style noodles in the photos above, but other noodles such as spaghetti, udon or soba work great. 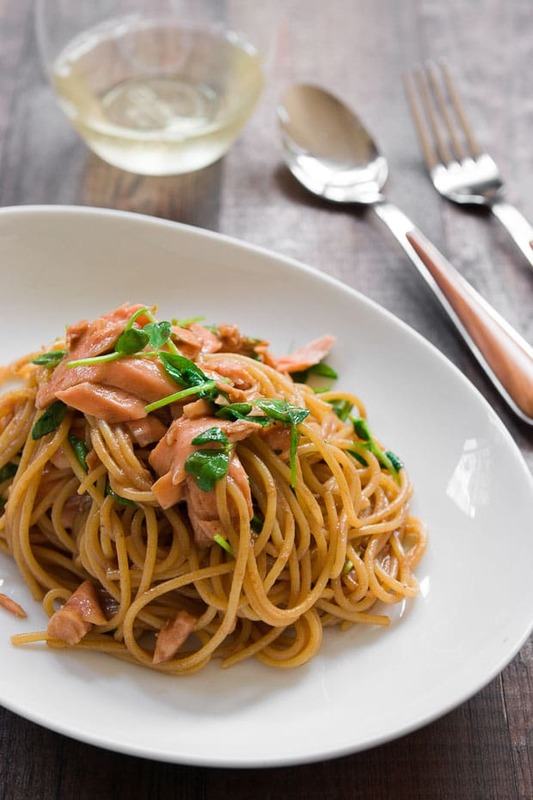 You can also toss in your favorite cooked meat, fish or vegetable to do something like the sous vide salmon and pea sprout garlic noodles I made below. 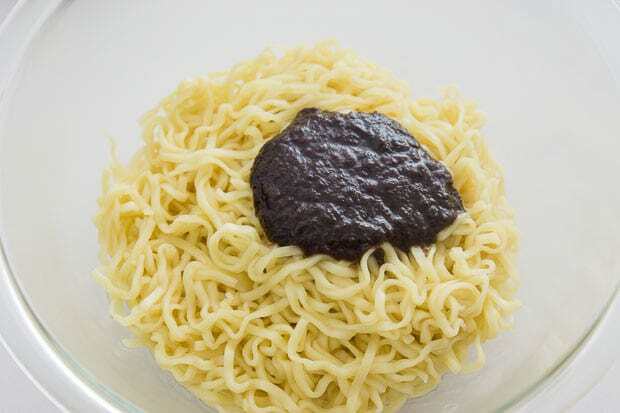 This makes about a cup of sauce, and since you don’t need all the sauce for the noodles, save the leftovers in the refrigerator for something else. Add 1/4 cup vegetable oil and the minced garlic to a pan and saute over medium-low heat until caramelized. Remove from heat and let it cool. 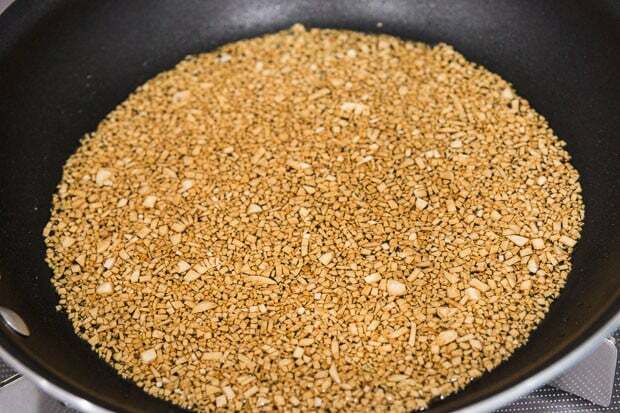 In a blender add the cooled caramelized garlic and oil another with another 1/4 cup of oil, the black garlic, fresh garlic, sesame oil, soy sauce, nutritional yeast, onion powder, and white pepper. Blend until smooth. Boil the noodles according to the package directions, drain and toss with some of the sauce (you won't need all of it) and adjust salt to taste. Garnish with thinly sliced scallions. OK. I’m with you that this sounds delish. But how do I make the black garlic? What, exactly, is “white” soy sauce listed in step 2, or is that a typo? Hi Larry, sorry about that, it’s a type from an earlier draft. To answer your question white soy sauce is a type of soy sauce that’s very light in color (not actually white, but light tan in color). Hi gofish50, you’d probably be better off buying it, it takes about 4 weeks to make. That said, if you have a rice cooker or crockpot you don’t use and don’t mind your house smelling like garlic for 4 weeks, you just add the whole heads of garlic and set the crockpot to the lowest setting (or a rice cooker on keep warm mode), and let it do it’s thing until the cloves of garlic are tender and coffee black. Hey Marc, is the coconut oil typo or not? And what nutritional yeast bring to that or is there any replacement? Thanks, I’m currently still making black garlic now, haha. Hi Nina, sorry about that it was a typo. You can certainly use coconut oil instead of vegetable oil though. As for the nutritional yeast, it adds umami to the sauce. It’s not absolutely necessary, but I’d say it’s pretty important. You could replace it with blend of vegetable powders (a blend of onion, cabbage, carrot, corn, should do it). Loved it. Made it today on soba: it had sweetness, savouriness, sharpness, creaminess and umami. Thanks for the inspiration!